Welcome To My Gebirgsjager Page. 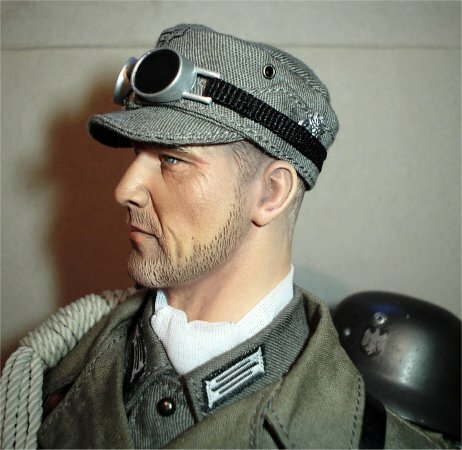 This page is about how I have made my German Gebirgsjager figure, because after seeing some of the excellent figures made by my fellow modellers. 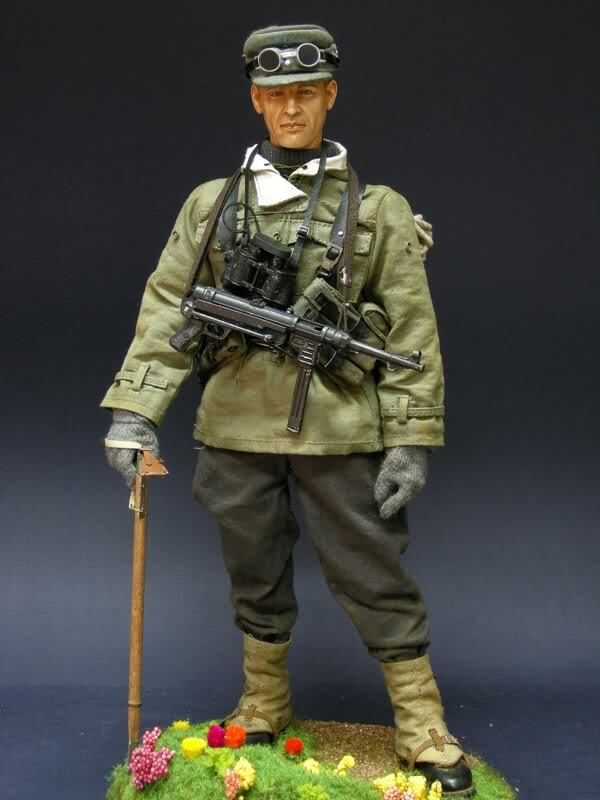 Especially the picture on the right here of a Gebirgsjager by matiascg and I just had to have a German mountain figure in my collection. And with this figure, I have spent a fair bit of time assembling all of the separate parts for it. Mainly because I kept putting off buying the Dragon Alfons 4 in1 boxed figure, and now that I want one I have found that the set is too expensive for me. 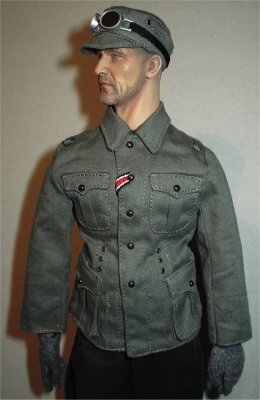 The head that I used for this figure is the DiD William Bowman one, as I do like the facial detail of it along with the beard detail. Again I have given this the pastel treatment and a light brush over of the Flesh coloured pastel to bring out the highlights. 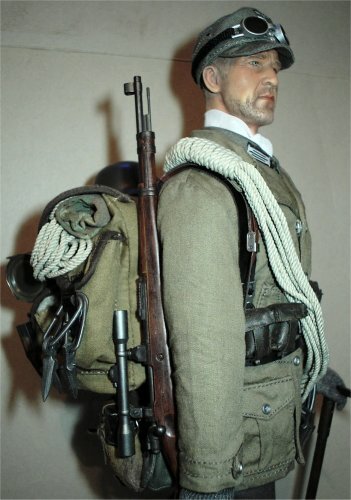 The main parts of the uniform are from the Toys City Gebirgsjager set, and I am very impressed with the detail of the cloth items. 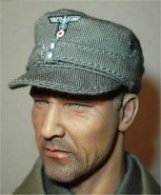 Although one item I did replace was the M43 cap, because once I got hold of the Dragon Alfons Robmuller cap and did a comparison of the two together. I found that the Dragon cap was of a thinner material, and it just seemed to sit better on the head. 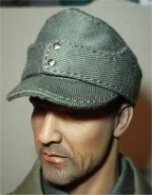 With the images above the first one on the left the figure has the Alfons cap, the next one is with the Toys City cap as a comparison. The next two pictures show the inside of the caps to show the size differences, as well as them alongside each other. 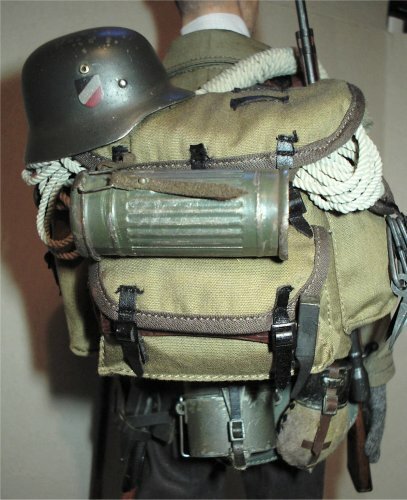 Another item that I forgot about was the cap that I have shown on the right, as this was an experiment I did where again I have used the green cloth backing under the Heer M43 cap insignia. I did this because I read somewhere about how some Gebirgsjager troops did this to the badge, to show off the Edelweiss insignia better. This was done the same way as the backing for the Narvik shield on my officer figure, the hardest part of doing this, was the cutting around the Edelweiss badge with my model knife to remove as much of the double sided tape as possible. Note: I found that if any tape is sticking out on the edges afterwards, I just gently pressed it under the insignia edges. 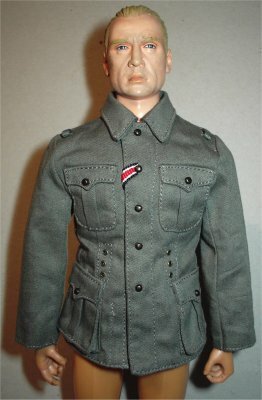 The first three pictures above show how the Toys City uniform tunic with the DiD figure I am using, plus they also show how the sleeve length is too short when used with this type of figure. 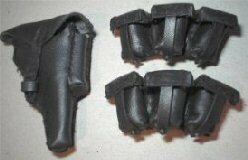 As shown in the middle two pictures of the sleeve cuff and arm of the DiD body. Because if you compare the left picture of the DiD body to the Dragon body on the right above, you can see how the tunic fits better on the Dragon body and the sleeve length is a lot better. 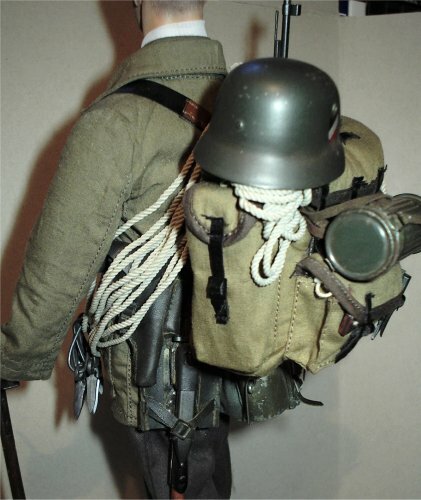 The problem with the tunic on the DiD figure, is because of the larger broader chest area on this type of model, and this can be seen with the way the tunic is pulled in tighter under the top two pockets. And if you look at the Dragon figure with the same tunic on, you can see that the chest area is smaller and the tunic fits better. 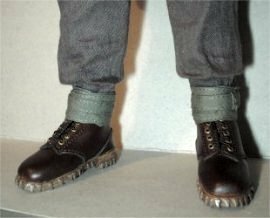 One problem I have found with using the Toys City uniform with a DiD figure, is that I had a heck of a time getting the trousers to look right. 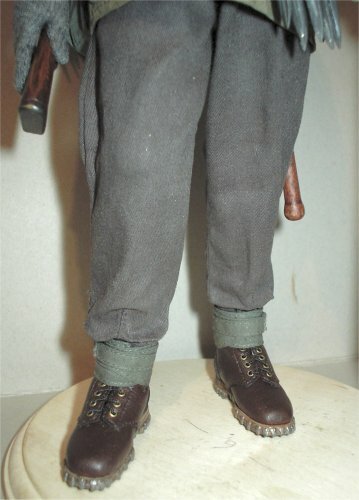 Mainly because the figure itself is slightly taller and the trousers when buttoned up around the waist, did not give me enough slack at the ankles for the blousing effect over the puttees. 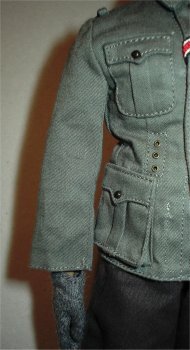 One thing that I had made my mind up about regarding this figure before I had even started it, was that it had to have the fabric gloved hands rather than the plastic type of hands. And this is shown below about how I fit the gloves to the hands on my figures. In the pictures above from the left, this is a DiD flexible hand and a fabric glove, next I feed the four fingers into the glove pulling it down slowly until I can get the thumb inside the glove as well. Note: Sometimes I have to squeeze the fingers and thumb together to get them all into the glove. Once they are all in, I then spread the thumb and fingers out as shown above right to get each one lined up, and I then pull the glove down over them. 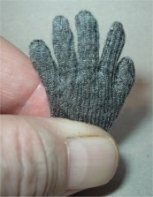 Then as shown above I gradually feed the thumb and fingers into the glove, and as shown above I use a pair of tweezers to press down between the fingers to get them into the glove fully. The next picture shows how I hold the bottom of the glove and the peg for the wrist joint, and I gently tap the pin on my desk, as this gently forces the hand further into the glove. 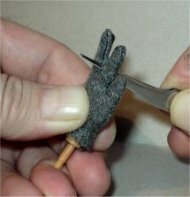 And with a combination of this and the tweezers, I can finally get the fingers all the way into the glove. 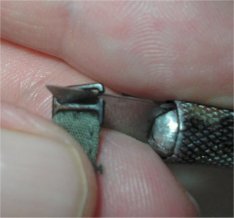 Note: If you use the tweezers to pull the glove down over the fingers, make sure that you do not use the pointed one's, because it can cause the glove to split. 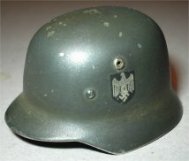 The helmet is metal and is I believe from the Jakob Blau DiD figure, but I am afraid that I got carried away and I don't have a before picture for this section. To get the chipped effect on the top I put the helmet shell into a plastic bag with some small woodscrews, I sealed it and then gently shook it to get the damage on the top. 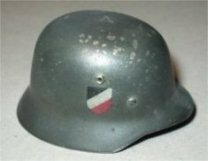 I then rubbed a pencil on some sandpaper to get powder, and then I dipped my finger in it, and lightly rubbed it all over the helmet, I then wiped over the helmet with a soft cloth to get a slight shine, a bonus was that it also darkened off the decals to make them look old. With the edges to get the chipped effect here, I used to my model knife blade to scrape along the edge to simulate wear. 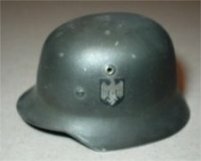 I then brushed over the helmet with some Tamiya Gunmetal powder to get a variety of metal shading. This was when I realised that it was just a little too shiny so I brushed over with Tamiya Mud powder to get a slightly dirty and dusty look and to dull the shine slightly. To finally finish the helmet off, I went around the helmet rim with a pencil to get a shiny Gunmetal edge, I also did this for the ventilation holes and the rivet tops. I also went over the helmet with the same pastel chalk I used for the equipment below, and as shown in the two pictures above right I have been able to get a dust effect where the rim starts. For this I just rubbed the pastel chalk into the fold, then I just gently wiped it off by going from the top to the bottom of the helmet. This then left the dust in the fold as shown. Note: Don't wipe around the helmet as it will remove the dust effect. The Toys City puttees themselves proved to be a real headache for me, with working out how they go together. 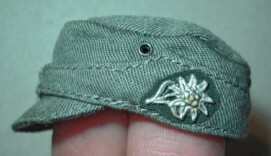 But once I realised that the buckle part comes apart as shown below left. 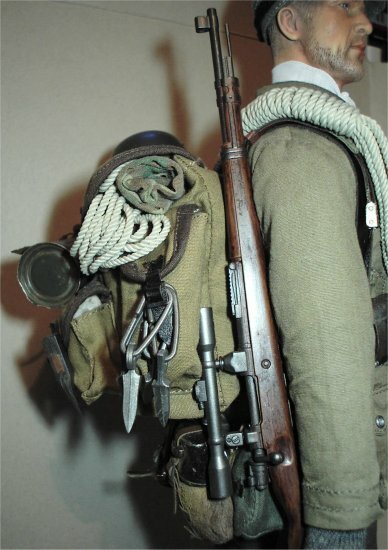 It was just a case of wrapping them around the boot tops and then carefully parting the buckle, so that it could be pushed behind the last puttee strap. 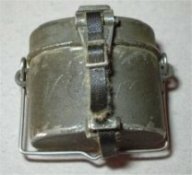 With the puttees as shown above, I could not work out how they went together until it was pointed out to me that the buckle has an opening as shown above left. 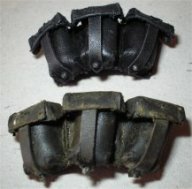 Note: This buckle I believe is plastic, so I have had to be careful handling them in case I break them. The next pictures show how I have wrapped the puttees tightly around the boot, and then opened the buckle and gently pushed it behind the thin strap to keep it all in place. Also shown in the middle picture above is where I have sewn the bottom of the trouser leg together, because there was a gap at the bottom of each of them. And this created a problem for me with the DiD body I used, due to the slightly taller figure. 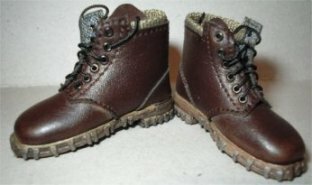 I do like the Toys City boots (above left) when compared to the DiD boots, because the Toys City one's are made of a softer 'pleather' type of material and they press down better onto the leg, so that I can get a tighter look around the ankle. 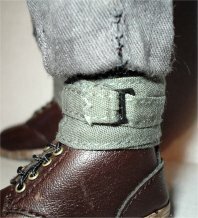 This helps me to get the same look with the cloth items, as the moulded plastic Dragon boots and puttees. 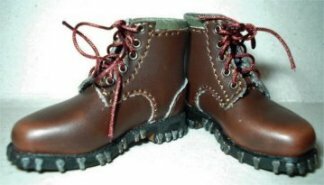 Note: Also with the laces from the boots wound around the boot tops before tying them off, this also helps to get the tighter look to the puttees. 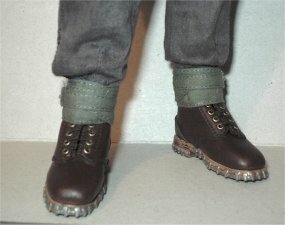 In the picture above right, I have given the boots on my figure a coat of some acrylic Matt Medium, to both dull them down and to take away the new look that they have. I also painted over the metal cleats on the sole, and I then repainted them with some Gunmetal paint to make just those shiny. For the equipment load out on this figure, it really is a gathering together of a lot of loose parts from the different model companies. One thing that needed changing I thought, was the rope that came with the Toys City set. As it annoyed me that there seemed to be a total lack of detail in it, as there was just not a tight enough twist to it and to me it just looked like string instead. 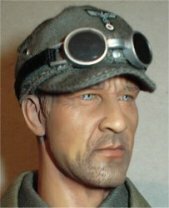 So I did a search for anything that may look better, and I found a company by accident that sells Scale Rope for model ships. 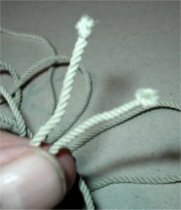 And after taking a gamble on it I bought some of the 2mm size rope, as that looked like the same size as the Toys City one. And as shown on the right here, it has a tighter and more in scale twist effect to it. Also it is a lot longer at 4 meters (about 13 feet) in length, which if I have my working out done right, can scale out to a length of about 78 feet in 1/6th scale. 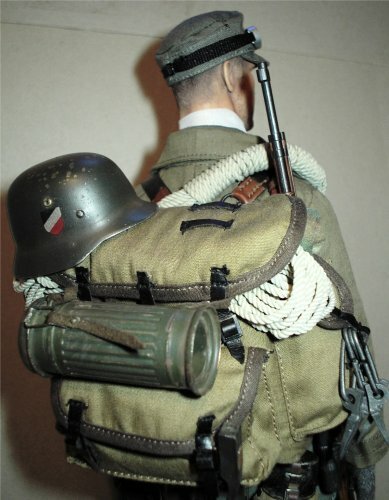 Note: The only problem is now that some of my other kitbashes will have to have the ropes changed on them as well now. 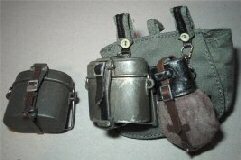 The Kar 98 ammunition pouches that came with the set are to me too shiny, and to again show a comparison I have repainted a DiD pouch (on the left) as shown in this picture. So seeing as the Black acrylic paint creates a very nice dull effect, I will be repainting all of the straps in this set to get the same effect. Along with a drybrush of a Black/White acrylic mix to add a wear effect to them. 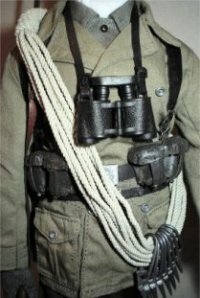 These pictures above show how I have repainted some of the other equipment I have for the figure, the top belt above left has been painted, with an un-painted one below it. The DiD mess can in the middle picture on the breadbag has just had some of the paint chipped and scraped away, by using my model knife blade to show wear, and a new mess can is shown on the left. The picture above right is of I believe a DiD 'pleather' holster and the ammunition pouches, which also have had a repaint of some Black artists acrylic paint to both lose the shine and also age the items. I also again gave them a drybrush with the Black/White paint mix, to add the highlights on all of the edges. This has added some detail to it, but I think a flick over the items with some Grout powder after the figure is assembled may add a bit of a lighter highlight effect. 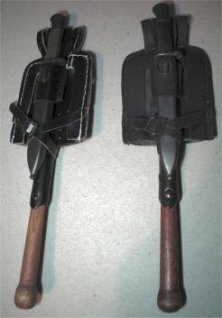 The picture on the right is the DiD shovel and I think a Dragon bayonet, these again have been repainted with the un-painted items on the left. The shovel I feel had to have a repaint as the white thread was really bothering me as it just stood out too much. With the painting I found that I had to use a slightly thicker mix of the acrylic paint and the water, which I had to let dry. So that when I touched up the missed parts, the new paint had something to stick to. It has come out a bit flat even after a drybrush, so I may try a very light Grey drybrush on the threads to hopefully highlight them to bring them out along with the edges. 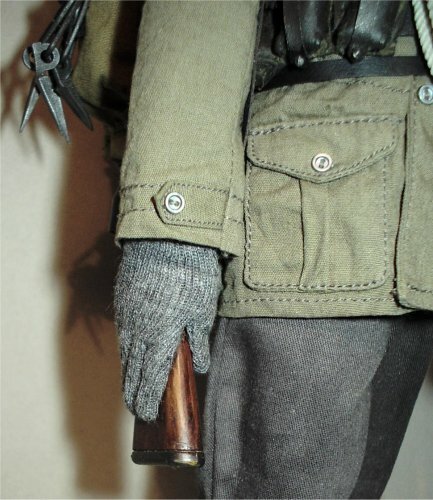 The wooden handle has had the same treatment I gave the rifle with the wood dye and shoe polish, and I think it has added a nice darker and aged colour and effect to it. 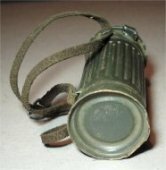 I had another close look at the figure made by matiascg and I noticed the excellent brown dust effect that he has inside the edges of the gas mask canister as shown on the right. 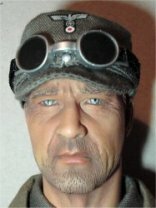 As I have always admired how some far better modellers than me manage to get this effect. 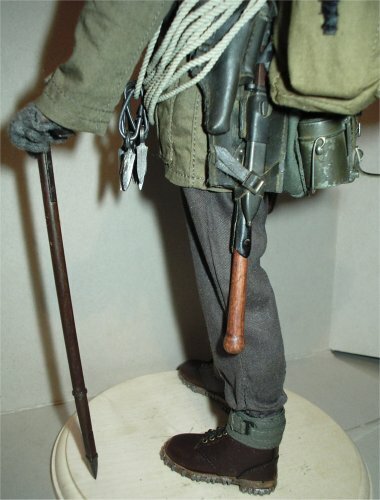 And I as usual, I got to wondering if I could try to replicate that effect on the shovel and bayonet for my figure. Since the more I looked at it as it is, I just could not get over how flat it looks, even after a drybrush of paint. 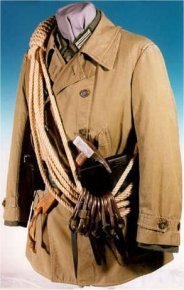 So in the pictures below as an experiment I used a Light Brown pastel chalk to 'write' over the threads, edges and the strap edges of the shovel and bayonet as shown below left. Note: My main reason for using the pastel chalks was that unlike paint, if it went wrong I could just wash most of it off. 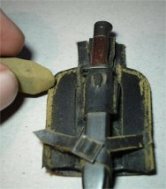 With the middle picture below I have used a dry soft tissue to wipe over the shovel and bayonet, and I was surprised at how it has left the chalk in the recesses and it has re-coloured the threads as well. Plus I has also aged the parts even further than the paint did, plus with wetting the tissue slightly, I wiped over the flat middle part of the shovel case to remove more of the chalk dust. This has had the effect of revealing the black paint more, which has made the threads and edges stand out even more. 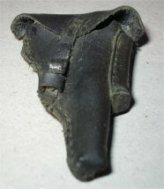 In the third picture above right I have tried the same method with the pistol holster, and to me it has transformed it from an almost flat black item to a well worn piece of equipment. 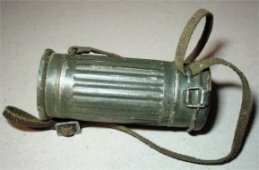 The last picture above right is one of the ammunition pouches with the pastel dust on it, compared to the other one that has just had a drybrush of paint on it. 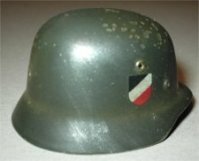 With this I tried the same method as I did on the helmet, but I found that the canister is made of a brass coloured metal under the paint. So to get the chipped and scratched effect I wanted, I have had to use a fine pointed paint brush to paint the edges with some acrylic Gunmetal paint. 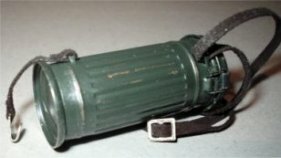 The other three pictures above show how I have got the dust effect into the recess and folds of the canister, this was done by rubbing the pastel chalk along the edges, so that it left the dust in the gaps and edges. This was then again gently wiped off to leave the effects as shown above. I also wiped the chalk over the straps, and I then rubbed them between my fingers to both rub it in and leave the dust on the edges. The mess can's above are for comparison purposes, on the left is a Dragon one as it comes from the box, the centre one is the DiD type from my figure, and the one on the right is the Toys City version again straight from the box. The picture above right has been touched up with the pastel chalk making sure that it gets into the gap above and below the raised lip, I also took the strap off and covered it in the chalk, which was wiped off to leave it on the edges, I then put the strap back on and then gave it a final wipe over. 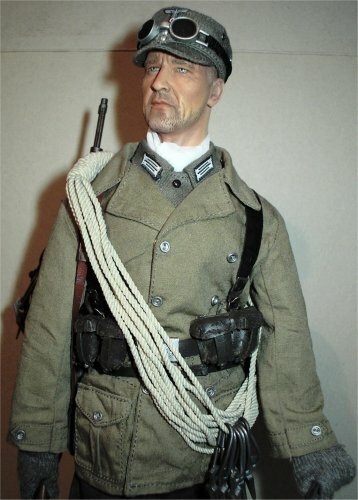 One item that I have had to make for this figure is the rope shank as shown on the right, and with the help from Heeresbergf�hrer with this picture I have been able to make this item. In the picture below left I have finally managed to wind the rope together to make this, and I have included the instructions on how to do this in the next few pictures. 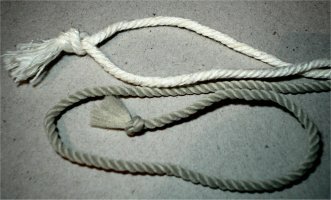 Note: I am not sure if this is the right way to tie this rope, but to me it looks right and it holds itself together. In the second picture below, I have tied the rope ends into a knot to stop it fraying as instructed by the person I bought this from. 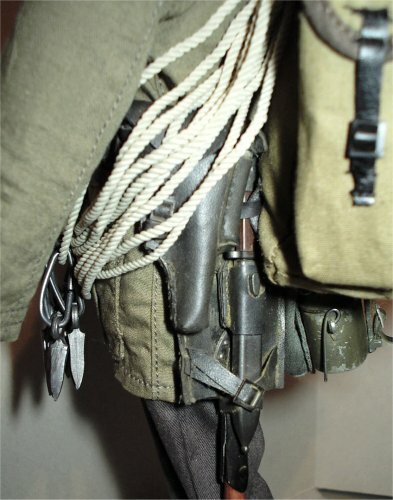 In the next picture I have started to make the loops, making sure that I keep hold of the rope end as shown. Note: Make sure that the loops are not too long and that they hang as shown on the right. The next picture below right, I have made the loops and I am now reversing the rope so that I have a small loop next to the other rope end. 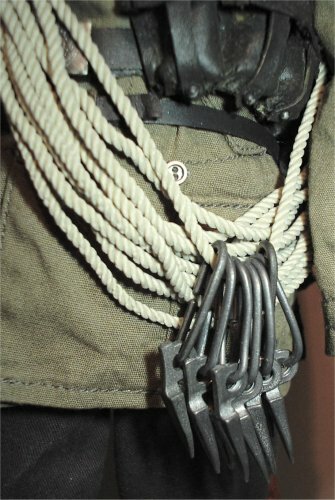 The purpose of this is that when I start winding the other free end of the rope over the top of the loops, it keeps the rope tight and it also holds the other rope end in place. In the first picture below I have wrapped the free end of the rope around the top of the loops, also over the spare end and the small rope loop as shown above right. 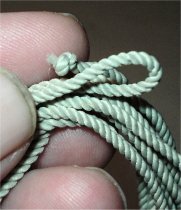 Note: keep the wrapped rope tight as you do this, and make sure that you place the knot from the other end of the rope inside the loops. In the middle picture below I have got to the end of the rope and now I am pressing it inside the wrapped rope loops to keep the whole thing tight. Then by pressing on each end of the wrapping I can keep this tight and make them all the same size as shown below right. 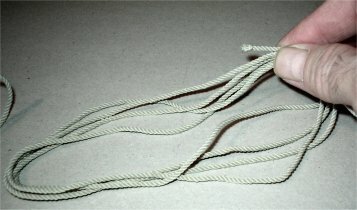 The final thing I do is grip the rope shank at both the top (with my left hand) and the bottom (with my right hand) and pull it all tight. Note: This can take a bit of experimenting in getting it right, because to get the one as shown above on my figure it took me four attempts to get that right. Also by making the spare end of the rope longer, you can make the wrappings go further around the top of the loops. With the rifle that came with the set I also gave that a repaint, as I wanted to have a better grain detail on the wooden parts. 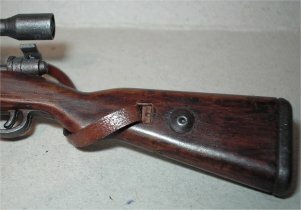 This was done by the same method as my other rifles on my Stocks page. I also gave the metal parts a drybrush with the Tamiya Gunmetal powders, and a very light brush over with the Silver powder to add some shiny highlights. 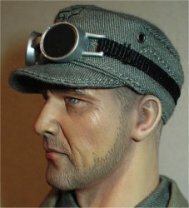 I would like to thank RogueJK for his excellent help with my future German figures. matiascg for his very kind permission to use his picture as a reference source. And a special thank you to Heeresbergf�hrer for all of the superb pictures and the detailed help with my mountain figure.